BILLINGS – Montana Fish, Wildlife and Parks officials are doing the preliminary work needed to repair the access road to the Indian Fort fishing access site at Reed Point and reopen the area to vehicle traffic, possibly some time next spring. 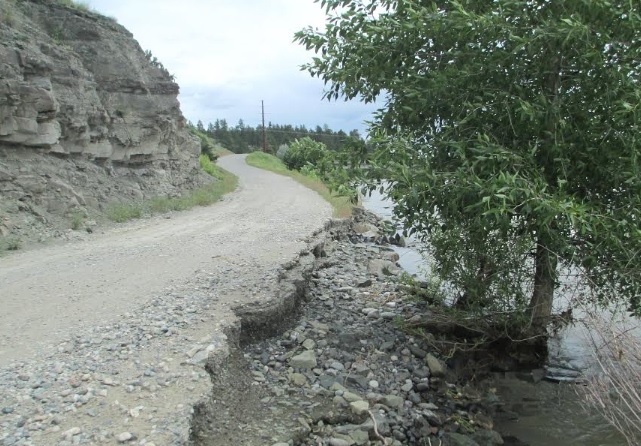 Flooding along the Yellowstone River in June washed out a portion of the roadway to the fishing access site, leaving a crumbling surface too narrow for safe vehicle travel. So the department restricted the area to walk-in traffic only. Reopening the fishing access site to vehicles is a priority for FWP in south central Montana. Getting permission or an easement from the adjacent landowner to cut into the cliff on the north side of the roadway. Obtaining necessary permits to work in the river to widen and stabilize the south side of the roadway. Preparing an environmental assessment since the extensive work is outside the scope of standard maintenance. Prepare cost estimates and finalize funding to do the work. FWP plans to draft the environmental assessment and complete permits and permissions this winter so construction could start after 2019 spring runoff. The department will try to redirect money from other planned fishing access site construction in south central Montana to the Indian Fort project, then tap into new capital funding money allocated by the 2019 Montana legislature. Indian Fort fishing access site is a 18.7-acre cottonwood bottom northwest of Reed Point that is popular with campers, fisherman and floaters. It includes designated and improved camp sites, river frontage, a boat ramp and access to other state land.